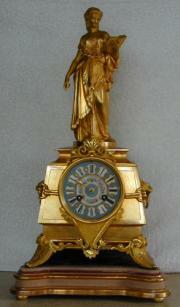 Early 19th century 8 day mantle clock by LeRoy from Paris. Rosewood and marquetry inlaid case with ebonised details. 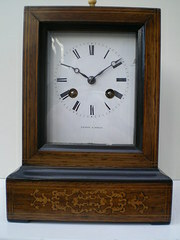 Ivory buttoned lift up front glass protecting dial and hands. Glazed aperture on case top. Silk suspension movement striking the hours and half hours on a bell. Slight damage to dial at 2`o clock position, see image. French ormolu mantle clock with porcelain dial by Aubert and co. 252, Regent Street, London. Standing on a giltwood and velvet base. Eight day movement striking the hours and half hours on a bell.